3. The Auschwitz Album found by Serge Klarsfeld and also conserved in the Yad Vashem. The photos from the first two sources, of common origin, were taken in 1942 and 1943 by SS Sergeant Kamann for the Bauleitung, for whom he worked, being in charge of the “Gardening” and “Photography” sections. Those from the third source were taken in May-June 1944 by SS Master-Sergeant Bernhard WALTER, responsible for the Identification Service located in Block 17 of the Stammlager, and his assistant, SS Sergeant Ernst HOFMANN. 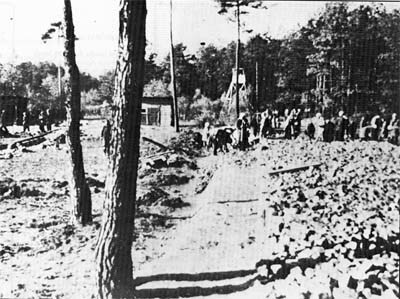 First photo of the site of Krematorien IV and V. The stone bed of the “Ringstraße / Ring road” is being laid by a kommando of women prisoners in the summer of 1942. The photo was taken on an east/west line and shows the western end of the Ringstraße, just before it turns south towards the Zentral Sauna. The section under construction here runs between the future Krematorien IV (on the left) and V (on the right). The temporary watchtower in the centre background serves as a landmark for situating this photo and the next. Photo taken on the same day and on the same line as Photo 1 showing the laying of the stone bed of the Ringstraße between Krematorien IV and V in the summer of 1942. 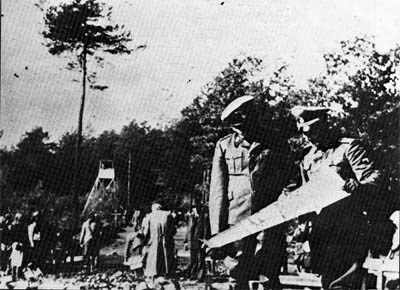 In the right foreground are two Bauleitung officers consulting a drawing, probably that of the road They are SS Captain Karl BISCHOFF, head of rhe Bauleitung, and SS Second Lieutenant Walter DEJACO, head of the Drawing Office. Behind Bischoff, on his right, is a civilian. probably an employee of Lenz & Co. one of the civilian firms working at Birkenau on the construction of the POW camp. Lenz & Co specialized mainly in site levelling, work that preceded the building of the suceessive construction stages (Bauabschnitt) of Birkenau. The very first photograph of the construction of Krematorium IV, taken between 1st and 15th January 1943, showing the east end (right foreground) and south side left). Work on the shell of the building was begun on Wednesday 23rd September 1942 by HUTA of Kattowitz, not by Riedel & Son of Bielitz as indicated on the deed of transfer of Krematorium IV, dated 19th March 1943. Messrs Robert Koehler of Gleiwitz built the chimneys. 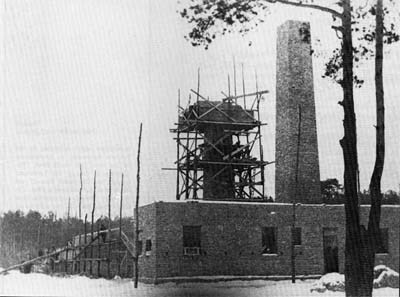 A total of about 80 men worked on worksite 30b, 60 or 70 of them prisoners, 20 of whom worked for Koehler on building the chimneys. The shell and chimneys of Krematorium IV were completed on 23rd January 1943 and Huta's subsequent contribution on this site was greatly reduced. Riedel & Son took over on 25th January 1943 and completed the work on the interior of Krematorium IV and also took over the construction of the shell of Krematorium V, worksite 30c, also begun by Huta but left unfinished. On this photograph the arrangement of the windows in the east end of Krematorium IV still corresponds to Drawing 1678, which meant that at a later date some had to be filled in and other openings had to be made. The walls of the coke store (near end), already built, were too high and part had to be demolished to fit the roof. The western part of the building was not shown on Bauleitung Drawing 1678 but did appear on the Konrad Segnitz drawing. The photograph is not very clear, but it would appear that only the foundations of the western end have been laid. The site foreman was perhaps waiting for the next stage in the program, which was Drawing 2036.